What's better than a personal digital assistant? A real assistant. When I met Aira's CEO Suman Kanuganti at a bar, I knew next to nothing about the company. Amidst a buzz of after-work drinkers, he handed me a pair of spectacles, the only slight abnormality being a camera on one side. I obediently put on my face and within a few seconds I heard a voice in my ear. "Hi, I'm Erin. How are you doing?" Wow, I thought, they've really nailed this AI assistant business. Erin then asked me how she could help, so I asked her to describe the room around me. As she went on to describe my surroundings in painstaking detail, I realized this wasn't a computer I was talking to at all, but a real person. "So the direction you're facing now, the wall is actually a red brick wall," she told me. "You can see a TV hanging on the left corner where the walls meet. There's a poster, if you can just turn a little bit to the right for me…"
This is exactly what Aira (Artificial Intelligence Remote Access) does: The smartglasses, which are based on Google Glass's design, are meant to be worn by people who are blind or visually impaired. They can then tap into a network of agents who can "see" for the person through a real-time stream, communicating through audio. This isn't meant to be a round-the-clock connection, but for those moments where someone might require additional assistance. Maybe they want to find a nearby coffee shop; perhaps they're at a restaurant and just want to read the menu. Last year, someone even used Aira to run the Boston Marathon. The company was founded in early 2015 and launched last year, using Google Glass as its reference design. 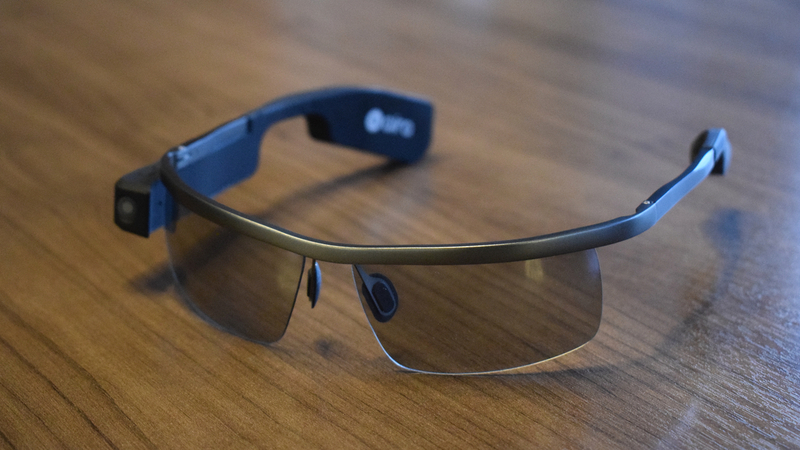 In fact, Aira is one of a small handful of partners with Google's Glass Enterprise program, Kanuganti explains, as he pulls one of the latest Glass Enterprise editions from his bag. The market of innovations for blind people is wanting, Kanuganti says, and this helped inspire the idea of a wearable assistant. "You see cancer biotech companies, you see dementia companies, even for deaf people there are lots of innovations. But for blind people nothing existed, for some reason, except for accessibility on iPhone." The glasses are free, but the subscription to use Aira starts at $89 dollars per month for 100 minutes of call time - all the way to $329 dollars for unlimited usage. There are around 100 agents right now, but Kanuganti says there are about 5,000 eager applicants in the pipeline. Users are assigned their agent at random when they call, but I did wonder if some people might get familiar with certain agents and start making special requests for their favorite names. They do get these requests on occasion, Kanuganti says, but Aira tries to avoid users having "favorites". Where that may change is with Aira's plan to assign users to agents with special expertise in select circumstances. Say one is at a basketball game, Aira could ensure they're connected to an agent who understands the sport. Aira is also working on geofencing major locations where the visually impaired are more likely to require assistant. In October, Memphis airport became the first to foot the bill for Aira users, so when they're using the glasses around the airport it won't cost them minutes. And if they don't own the glasses, Aira can be used through the smartphone camera instead. Since then, Aira has done similar deals with Minneapolis and Houston airports. "Airports are one of the most complex environments from the blindness perspective," says Kanuganti. "People are normally intimidated to go there. And even if they choose to go, they usually call in ahead and tell them that they need assistance". Aira wants to do the same thing at other locations, including large shopping stores like Walmart, and theme parks like Disneyland. Kanuganti believes the price to support Aira in these locations often offsets a larger cost on staff to assist the blind. Lux Capital and Arboretum Ventures are among Aira's biggest investments, but there's a lot of interest coming from companies including Microsoft and Google X. Lyft has already teamed up to give riders Aira assistance, while AT&T partnered with Aira for a back-to-school program to help blind students transition to college. But there are also problems in the blindness industry Which Kagnuganti hopes Aira can help ease. "One fun fact: this is the first time in the blindness industry that a company, Aira, was able to get all the major presidents on one table, because there are unexpected political bureaucracies within the blindness organizations," explains Kanuganti. "One one end of the spectrum we have NFB, and their philosophy on blindness is entirely different to ACB and their philosophy." Perhaps Aira can help "unstick" this problem too. But it's a fascinating technology in and of itself. Yes, it can solve a lot of everyday inconveniences, but more importantly it can free the visually impaired from what would otherwise be intimidating experiences. "It's about dignity as well. That's the value proposition."